Bijou Camberwell is the pinnacle of modern home design, gracefully incorporating contemporary features and finishes to luxurious effect. 699 Burke Camberwell is the pinnacle of modern home design, gracefully incorporating contemporary features and finishes to luxurious effect. The development comprises 37 high-end apartments across 9 levels with carefully-composed 2 and 3 bedroom layouts. 699 Burke is a vision brought to life by Fender Katsalidis Architects. Fusing the spirit of Camberwell’s manicured streets and a breathtaking facade, the development creates a powerful impact before you even step inside. The architecture makes its mark with undulating balconies that punctuate the exterior in parallel, sharing an overflow of plant life. Crafted by Plus Interiors, the apartment designs are born out of detailed attention to lifestyle and forward-thinking artistry. Empowering the buyer with creative influence, each apartment can be coloured in either a modern or a classic scheme. In each case, the refined, cohesive palette emanates elegance. Smokey grey or pale oak timber floors blend fluidly with their respective wall coatings, illuminated by recessed downlights or sunlight flooding in through expansive glazing. “The appreciation of light and luxury underpins the interior design of the apartments at 699,” explained Brad Preston from Plus Interiors. The kitchen is a picture of contemporary culinary excellence, decorated with luxuriously-appointed marble benchtops and elegant chrome tapware. With Miele appliances fitted throughout and a Fisher & Paykel smart fridge-freezer, you’ll be cooking up a storm at every opportunity. What better way to put your state-of-the-art kitchen to use than to throw a big dinner party for your friends or family? With ample space for a long dining table, you’ll be able to comfortably accommodate all your guests and even their plus-ones. And with floor-to-ceiling windows lining the open-plan living space, the spectacle of Melbourne’s city skyline will be the cherry on top of your evening of entertaining. The bedrooms are your cosy corner for personal retreat complete with 100% pure wool carpets and translucent drapes to create a filter between you and the world beyond. The bathrooms are an extension of the apartment’s well-considered design, taking the level of luxury up a notch with brushed brass tapware, porcelain tiles and bronze-backed mirrors with satin finish. The inclusion of both a rainforest showering and a bath exemplify not only the spaciousness of the bathroom but the designer’s dedication to creating a personalised and privileged lifestyle. Residents will have unlimited access to 699's open-air sky garden rooftop. The elevated space hosts a lounge, bar and dining area to suit all occasions. 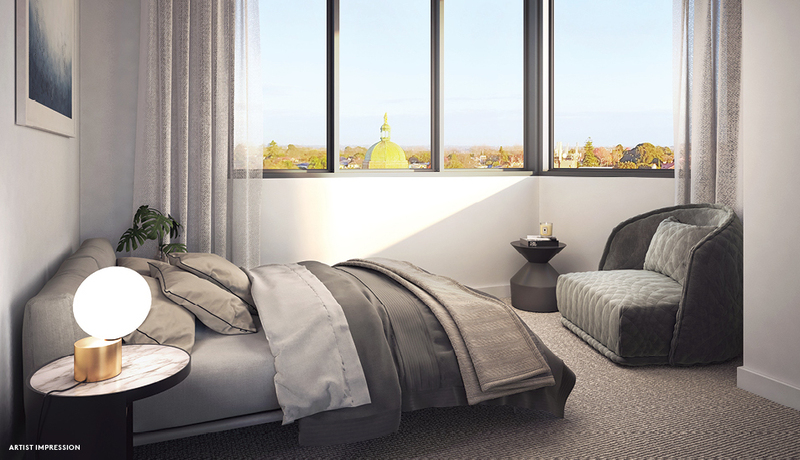 With beautiful views of the surrounding leafy suburbs and Melbourne's iconic skyline in the distance, you will never tire of relaxing in your sky-high retreat. The Camberwell area is known for its delicious eateries, stunning parks, premier schools and elaborate shopping possibilities. In conjunction with its extremely well-groomed streets, Camberwell has a growing reputation of being a blissful place to live. Make the most of your Sundays by strolling down to Provence Artisan Bakers to pick up a tray of indulgent pastries and when evening comes around, treat yourself to an unbeatable Italian dish at Boss Pizzeria. And for a taste of nature to work up an appetite, stroll around the perfectly-preened flowerbeds in Read Gardens. For more information or to enquire about 699 Burke, click here. For more Melbourne apartments currently available, click here.